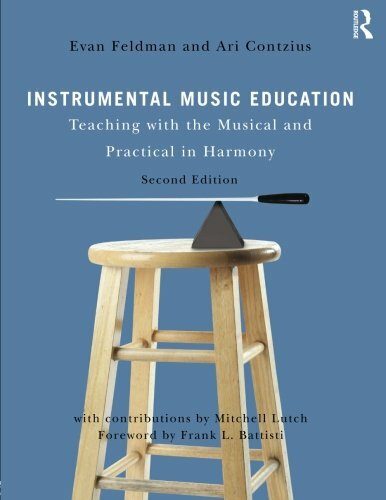 Instrumental Music Education: Teaching with the Musical and Practical in Harmony, 2nd Edition is intended for college instrumental music education majors studying to be band and orchestra directors at the elementary, middle school, and high school levels. This textbook presents a research-based look at the topics vital to running a successful instrumental music program, while balancing musical, theoretical, and practical approaches. A central theme is the compelling parallel between language and music, including “sound-to-symbol” pedagogies. Understanding this connection improves the teaching of melody, rhythm, composition, and improvisation. The companion website contains over 120 pedagogy videos for wind, string, and percussion instruments, performed by professional players and teachers, over 50 rehearsal videos, rhythm flashcards, and two additional chapters, “The Rehearsal Toolkit,” and “Job Search and Interview.” It also includes over 50 tracks of acoustically pure drones and demonstration exercises for use in rehearsals, sectionals and lessons. • Alternative, non-traditional ensembles: How to offer culturally relevant opportunities for more students, including mariachi, African drumming, and steel pans. • The philosophies of Orff and El Sistema, along with the existing ones on Kodály, Suzuki, and Gordon. • The Double Pyramid of Balance: Francis McBeth’s classic system for using good balance to influence tone and pitch.